While picture postcards were first proffered to the American public in May of 1893 at the World's Fair Columbian Exposition in Chicago, experts assert that the first baseball-themed card appeared in 1900 -- depicting Pittsburgh Pirate great Honus Wagner and two of his teammates, Duff Cooley and Tommy Leach. Many vintage baseball postcard collectors believe, however, that this Pittsburgh Pirate "Real-Photo" card may have been pre-dated by private Real-Photo cards, featuring players from obscure town teams. Either way, baseball became a popular subject for the postcard-buying public a scant seven years, or so, after the cards first appeared on the American scene. Rare R.W. 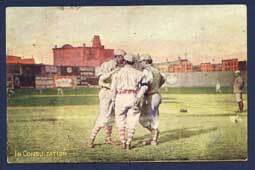 Johnston Studios Triple-Fold Postcard of the 1909 Pirttsburgh Pirates. Both Wagner and Leach were still with the team. Wagner can be seen third from the right, while Leach is standing second from the left. When this card was printed, the Pirates were the National League Champions (as is captioned on the front of the card). This team went on to defeat Ty Cobb's Detroit Tigers in the World Series, with Wagner batting .333 over the seven-game series. Real-Photo postcards refer to cards that actually are photographs, developed on photographic paper the same size and weight as traditional, publisher-issued postcards. Like other postcards, Real-Photo cards feature a postcard back complete with stamp box. First popularized in 1901, these postcards can be identified by the images themselves, as well as by the stamp boxes, which identify the manufacturers of the photographic paper. More common names are AZO, Cyko, Velox, and later EKC and Kodak. Because these cards could be made simply by purchasing paper and developing a photo directly onto it, most Real-Photo cards depict semi-pro and town teams. However, some of the rarest postcards of this type feature Major Leaguers, often in candid poses. Beginning around 1903-05, publishers of postcards began to issue cards that depicted individual players and professional baseball teams. These cards were issued by a wide array of publishers -- ranging from Major League teams to newspapers to new companies cashing-in on the postcard craze. Prior to 1907 these early player cards all were issued in black-and-white and all featured undivided backs. By law, postcard backs could only be used for addresses -- with all messages having to appear on the fronts, often written in any space not dominated by the image itself. In March, 1907, the government granted permission to "divide" the backs of postcards, with one half devoted to messages and the other to addresses. Also in 1907, the first full-color baseball postcards appeared, issued by The Morgan Stationery Co. of Cincinnati and spotlighting in-action images of the Reds. Second baseman, Miller Huggins, was the only player featured by name and awarded two versions of his card. These postcards are commonly known by collectors as the "Red Belt" series. 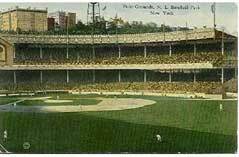 Perhaps the most popular among traditional postcard collectors (as opposed to baseball card collectors) are ballpark postcards, spotlighting major league, minor league and even semi-pro and amateur baseball fields. These postcards span the decades from 1900 until present-day, with one of the earliest published cards depicting Philadelphia's Columbia Park. Columbia Park was the home of Connie Mack and Ben Shibe's Philadelphia Athletics until the creation of Shibe Park in 1909. Interstingly, the construction of Shibe Park spurred a flurry of postcard publishing activity centering on the new structure. The most desirable stadium postcards were published in the Pre-Linen Era, which ended around 1930, when publishers began issuing cards printed on a linen-type stock (consisting of a higher rag content and lesser-quality, inferior inks).